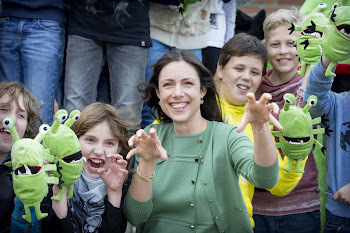 Pregnant Princess Viktória de Bourbon de Parme give stuffed animals to children of the Paperclip school in Krimpen aan den IJssel, The Netherlands, 9 November 2015. The animal is designed by Koen Schnitker. Princess Viktoria, patroness of Save the Children, handed out the animals later on the day to children at cancer center Daniel den Hood. The event is an initiative of IKEA, Save the Children and UNICEF.